Is your allegiance to the Horde and Alliance so strong that you'd spend $159.99 on a World of Warcraft branded wireless headset from Creative Labs? Should it be? Ask any World of Warcraft raider and they'll tell you; communication is key to being a successful raider. You have to listen to your raid leader. You have to keep an ear out for audio cues. You have to have the right heavy metal music playing in the background, or taking down the Lich King just isn't as intense as it should be. To that end, Creative Labs offers the World of Warcraft wireless headset, incorporating the latest THX TruStudio PC technology and sporting a design that makes it look as if you pulled it off the freshly-killed corpse of a raid boss. Is this loot you should roll need on, or should you leave it for the Hunter who rolls on everything? So Very Comfortable: The World of Warcraft wireless headset is a daunting beast, with a stylized shell designed to mimic armor from Blizzard's MMORPG. It looks bulky and uncomfortable, but due to the light plastic used in construction it actually rests quite comfortably on the head. The oversized ear cuffs are so large that even my larger than normal lobes fit comfortably within, and the padding gives just enough to keep my glasses comfortable while still doing a fine job of filtering outside noise. Convenient As Well: The software that comes with the headset, styled to look like a World of Warcraft in-game menu, provides plenty of options for customizing your listening experience, from changing the color and intensity of the lighting of the Horde or Alliance shields located on the outside of the cuffs, to a graphic equalizer and THX effects panel for fine-tuning the sound. I particularly enjoyed the ability to assign hot keys to adjust your audio on the fly, a convenience I never knew I cared about until now. Rich, Full, and Versatile Sound: The World of Warcraft wireless headset is one of the first Creative Labs products to incorporate the company's new THX TruStudio PC sound technology, delivering a new set of tools to help maximize the enjoyment of PC audio. A crystallizer adds a certain vibrancy to music. Smart volume equalizes music tracks so I do fall out of my seat when a particularly loud track in my playlist kicks in. As someone who watches a lot of TV on his PC, the Dialog Plus option, which raises voices in sound and movie files above the background sounds, is a godsend. By using hot keys to turn these features on and off, I barely ever had to go back into the setup software to adjust the settings. It's the kind of convenience you can't pay for. Well, the kind of convenience you pay a great deal for. The Branding: With glowing trademarked icons on either side of the cuffs, it's hard to accept that part of the price we're paying here isn't for the World of Warcraft name, especially when you consider this is the priciest headset that Creative Labs currently offers. It's slightly ironic, as I would be more apt to spend the money on a pair of headphones that had the same basic feature set without the clunky WoW design. Rigid Mic: Perhaps people with smaller heads don't have this same issue, but as a large-craniumed American, the rigid removable mic that comes with the World of Warcraft wireless headset sits right at the same level as my nose, meaning a constant stream of breath can be heard if I don't mute the mic during conversations. The rigid microphone has some small movement, but nothing in the range I'm used to with cheaper headsets from other companies. While the sound is rich and the functionality superb, it's the design of the World of Warcraft wireless headset that makes it so easy to discount as a gimmicky marketing tie-in. With glowing lights and bulky plastic, it looks more like a children's toy the high-tech piece of equipment it is. Had Creative Labs packed this technology into a sleeker, more streamlined package I would have no problem recommending it to anyone willing to lay out the money, but I'm not sure I'd savor spending $159.99 to be a walking, talking World of Warcraft advert. If I need to advertise my WoW allegiance, I can always buy a t-shirt. 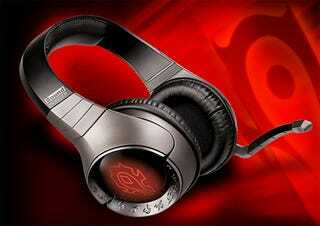 The World of Warcraft Wireless Headset was released by Creative Labs on March 22. Retails for $159.99 USD, with a USB wired version available for $119.99. A unit was sent to us by the manufacturer for review purposes. Used headset as sole source of PC audio for a month.